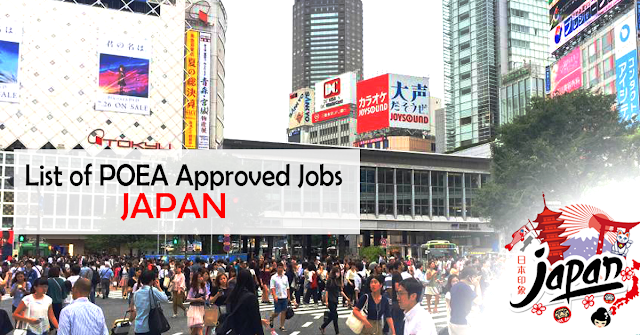 Good news to all aspiring Filipinos who wish to work outside our country: more opportunities and choices await you as POEA approved the jobs to Japan this 2019. Industries in need of foreign workers are food service, manufacturing, food and beverage, care workers, building and cleaning management, construction, aviation and agriculture. According to Jocelyn Sanchez, deputy administrator of the Philippine Overseas Employment Administration (POEA), almost 345,000 foreign workers is in need to cover the labor shortage of the said country. Workers who have worked for more than 5 years in Japan would also be allowed to bring their families and apply for immigrant visa. Agencies who have approved job orders from POEA were listed below together with Vacancies and Position. General Reminder: This site is not associated with these agencies or in POEA. All information from this article is taken from POEA website. For your own safety, please don't comment your personal details.